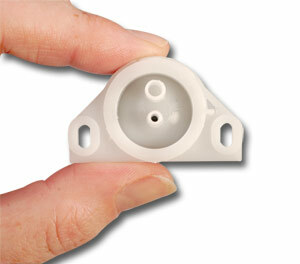 These sensitive single pole switches can be used as pressure or vacuum switches, or as differential pressure switches. Note: Pressure settings may change over the temperature range. Media: Clean dry non-corrosive gases only. Note: The pressure media entering through Port A is in direct contact with the electrical contacts in the switch. The media entering through Port B is separated from the electrical contacts by the diaphragm. Connect the pressure source to Inlet Port B and set the adjusting screw to the desired pressure setpoint. Turning the screw clockwise narrows the gap between contacts and decreases the setpoint. Turning the screw counterclockwise increased the gap, increasing the setpoint. Note that the media entering through Port B is separated from the electrical contacts by the diaphragm. Connect the pressure source to Port A and monitor continuity across the terminals. Slowly turn the adjusting screw clockwise, narrowing the gap between the contacts until the contacts are closed. Apply the setpoint pressure which will open the contacts. Continue to turn the adjusting screw clockwise until the contacts make and break at the desired setpoint. Repeat above using Port A for Normally Open contacts and Port B for Normally Closed Contacts. Nota: Custom switches and pre-fixed setpoint at customer specified value available, 50 piece minimum order. Consult Pressure Engineering.